To change the character encoding, press the menu button in the upper right corner and select character encoding. There are tons of legacy encodings there so I probably will add some of them in next months. Finally new updates on DroidTerm! I managed to fix the first and foremost bug that was present on previous releases of DroidTerm, the unresponsive scroll when data was received. The text renderer is completely new and it offers and smooth scroll and keeps the app responsive. After much thought I’ve decided to split DroidTerm into two apps, one free (with ads) that contains the same features, plus the scroll fix, than previous versions and other paid version with no ads and more features. My intention is to keep the Free version stable as it is useful for the common user and add more complex features to the PRO version. Try first the free sure to be sure it fits your needs, if you need the PRO features or you find DroidTerm useful and you want to help in its further development consider buying the PRO version. 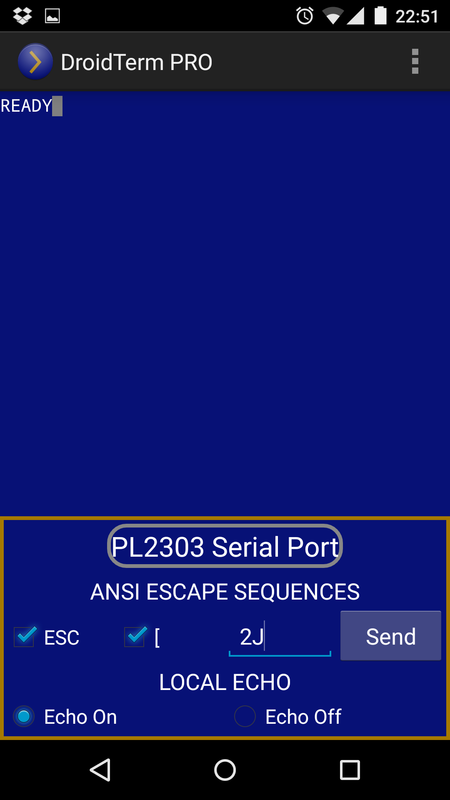 DroidTerm PRO allows to send a subset of the ANSI control escape sequences. Designing a good interface to support this feature has been more complicated than I thought. Instead of relying purely on the Android keyboard the ‘ESC’ and the ‘[‘ button are check buttons that can be set to ON or OFF, the rest of the command must be written in a field. When the command ready, press the ‘Send’ button. Some systems echo back whatever you send but in some configurations need local echo. Local echo can be ON/OFF easily by the checkboxes below the the ANSI escape sequences. Both versions use UsbSerial to handle serial port which is free, open source and can boost your projects too!